HILO, Hawaiʻi - A blessing of the HiEHiE unit took place at Moʻoheau Bandstand in Downtown Hilo on Friday. 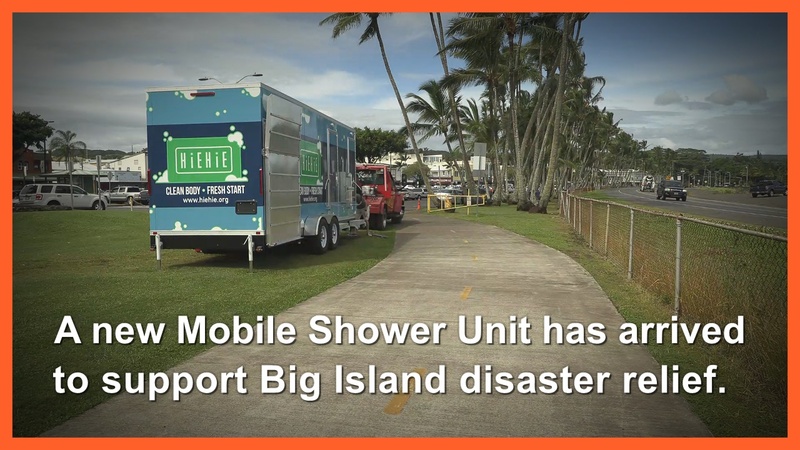 The Hawaiʻi Island dedicated mobile shower unit, HiEHiE, was purchased with donations raised during the Puna lava eruption. (BIVN) – A new Mobile Shower Unit has arrived to support Big Island disaster relief. On November 16, Project Vision Hawaii unveiled its HiEHiE unit, purchased with donations raised during the Kīlauea eruption. Today, Project Vision Hawaii unveiled its Hawaii Island dedicated mobile shower unit, HiEHiE, purchased with donations raised during the Puna lava eruption. The event took place at Mooheau Bandstand in Downtown Hilo. In June of this year, Project Vision sent its Oahu-based mobile hygiene trailer to Hawaii Island to support disaster relief and modular housing in Pahoa. Project Vision worked with Puuhonua o Puna to raise $75,000 towards the purchase of a Hawaii Island-dedicated shower unit. HiEHiE, which is Hawaiian for “to beautify, make distinctive in appearance,” aims to restore dignity and transform a person internally and externally, one shower at a time. The mobile shower unit contains three private bathroom stalls, each complete with shower and toilet; one stall is ADA compliant and includes a diaper changing table. The unit, assembled in Illinois, was shipped out of Long Beach to Hawaii courtesy of Matson Shipping. Hawaii Lodging & Tourism Association (HLTA) was first to commit $20,000 towards the effort, with $5,000 going to initial 30-day operations of HiEHiE on Hawaii Island, and the remainder to support operations of the Hawaii Island-based hygiene unit. Latter-Day Saints (LDS) Charities contributed $30,000. Hawaii Island United Way donated $30,000 towards the purchase of a truck that will haul HiEHiE. Contributions also came from The Bill Healy Foundation ($10,000), Jackson Lewis Law Corporation ($5,000), the Ke Kai Ala Foundation ($5,000), Council Member Karen Eoff ($3,000), Council Member Maile David ($2,000), the Kohaniki Ohana ($1,500), and McCully Works ($1,000). Par Hawaii donated $2,000 in fuel and propane to operate the shower trailer, with a pledge to provide future support. Project Vision operates four mobile vision and health screening medical units across the state in an effort to increase access to healthcare. HiEHiE on Hawaii Island is Project Vision’s second mobile shower unit in the islands; the first was launched on Oahu in February of this year.